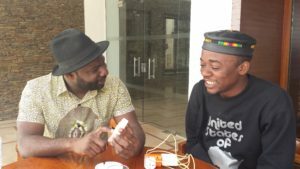 Home » entretiens » What is it like to make a film in Ghana today? While the Kumawood* films remain the most common and fastest way to make films in Ghana, independent filmmakers are trying to set themselves apart from this mainstream and reach out to the international network for greater visibility. What’s is it like to make a film in Ghana today? The director of The Burial of Kojo, Blitz « The Ambassador » Bazawule, and producer, Boateng « Boat » Kwaku, try to answer the question. Kumawood is a reference to the Ashanti region Kumasi. It is the fast-film industry, producing comedies within a two-week time span. The kind of film you watch, laugh along with and then go to bed. It attracts huge non-cinema-going audiences. In Accra specifically, there’s what we call the Accra niche, an upper-class elite portrayed in films: nice people, nice houses, glamour galore. This kind of cinema does bring in audiences but has little impact on the industry as people only show for premiere nights. The films barely last a week in cinemas so it’s not consistent and they struggle to survive; the box-office money generally ends up in the cinemas’ pockets. Besides that, Accra’s two to three cinemas mostly show Hollywood films the rest of the time. And then you have films that kind of target festivals, representing Ghana on the international stage, films that are barely seen locally. Azali by Kwabena Gyansah (also in completion in Luxor African film festival 2019), for example, also sets out to cross borders to reach a more international audience. « You have to decide where you are going: do you want to be a Kumawood filmmaker? Do you want to be a better storyteller? Or do you want to be a Ghanaian filmmaker who takes Ghanaian stories to the international stage? « , says producer Boateng Kwaku. Taking Ghanaian stories onto the international stage, however, is a huge undertaking. According to the producer, it takes you about three years, three years that obviously neither Kumawood or Accra’s niche films have time for. « If you don’t have the elite’s stories or the local content produced on a weekly basis, you have to play a much longer game, looking for awards, hunting for cash, seeking out licenses from bigger platforms, airlines, Netflix – any kind of opportunity that might come your way« , says Blitz Bazawule. For everybody, the biggest challenge is governmental infrastructures and oversight. Behind the film TBOK, there is also an advocacy project. The film team does not just want to show films but also to form an important advocacy team to travel the world and influence the government and policy. « We have to play several roles at once; we have to be curators and archivists. Hopefully we will be able to have some influence, » explains Blitz Bazawule, « Education is our main purpose. Educate our peers on production values, on acting, on African cinema, to change our fellows citizens’ taste in film, » Blitz continues, « We ourselves teach cinema but also try to make sure the audience is educated, that they understand Ousmane Sembene, Djibril Diop Mambety and Kwaw Ansah so they can grasp TBOK better« . So far, the team has been programming and curating free public screenings and reaching out to up to 500 people on a monthly basis. Those screenings included places like Soccer Park where people where have the opportunity to experience cinema not only from Ghana but from all over the continent.